Are you ready to get your groove on with a great color combination? Each week we will provide a delicious cupcake to inspire you to craft. We encourage you to create a project of your choice, following our inspiration theme or color palette and link your creation. Cupcake images are not required! New challenges are posted each Sunday at Midnight CST. The deadline to enter is Saturday July 25 noon CST. 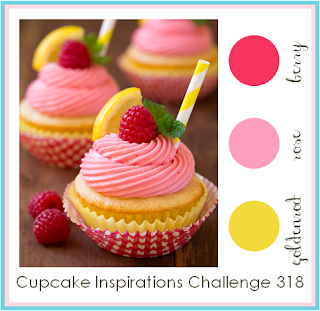 Please include a link back to our challenge and post the Cupcake Inspirations badge or challenge image. All entries must be direct links to your project post for this challenge, not just your blog in general. Those not directly linked will be deleted. Maximum of 3 entries per person per challenge, please. Prize winners are randomly selected from all entries. The Sweet Six are our top 6 selections of the entries. Please note that in the event that less than 10 entries are linked, we will pick the top 3. 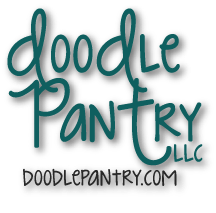 A special thanks to Doodle Pantry for sending us each an image to work with! And they are offering up a sweet little prize for our lucky random winner this week! 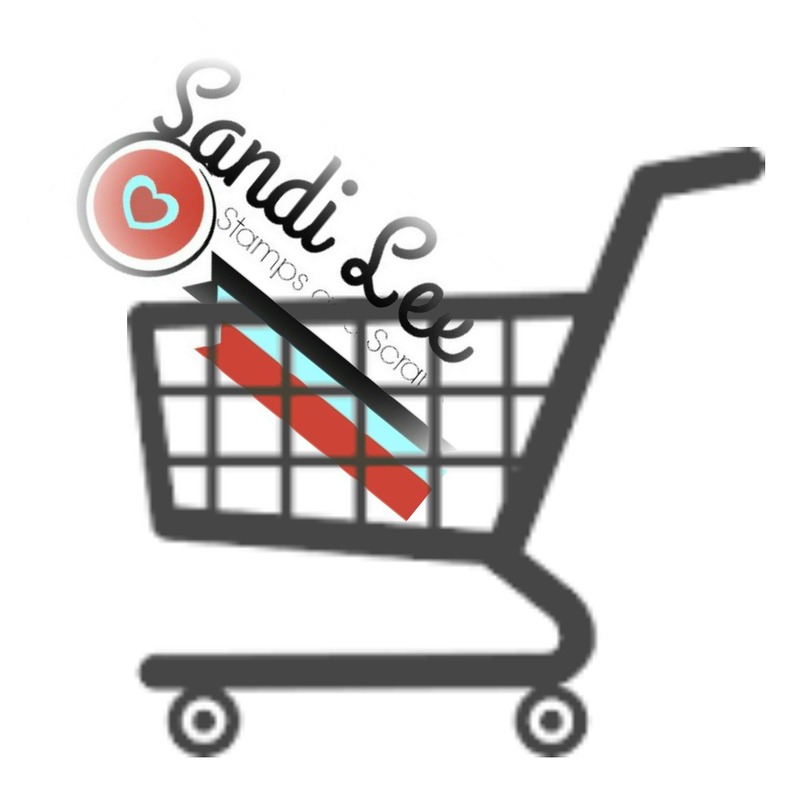 supplies; papers- black and white (glitz), apple jack (sassafras lass) and white cs (neenah); stamp-bird bath joy (doodle pantry); ink-C1, YG23, YG45, Y17, R43 (copic markers) and DR1 (spectrum noir); accessories- ribbon (stampin up), black pearl (recollections). I created my scallop edge by cutting circles out with my circle punch and cutting them in half. I then adhered them to the back of my cardstock. 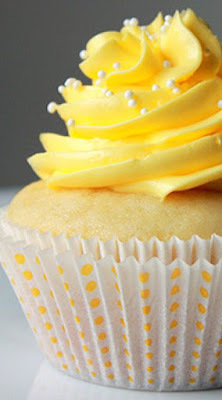 I was inspired by the yellow on the cupcake. What a cute, cute and adorable card...so "tweet"! 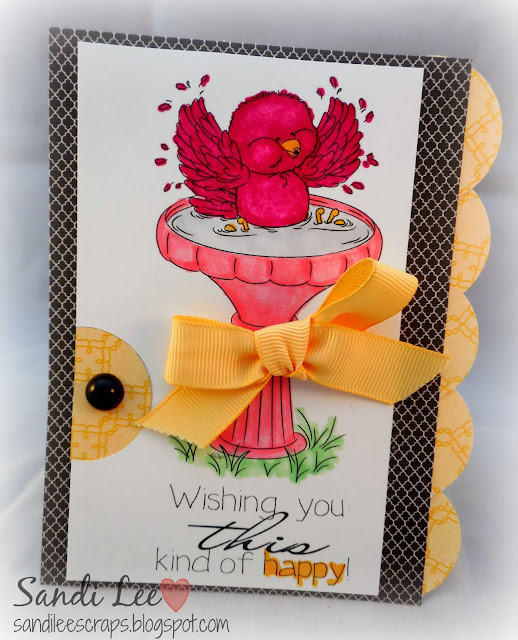 Thank you for joining us at "The Shabby Tea Room" for our "Sweet As Sunshine" challenge! 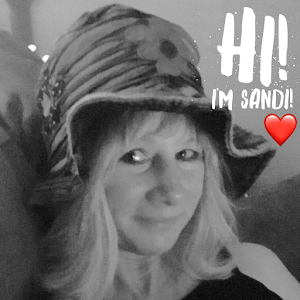 Thank you soo much for taking part in our "Anything Goes” challenge over at Crafty Friends. 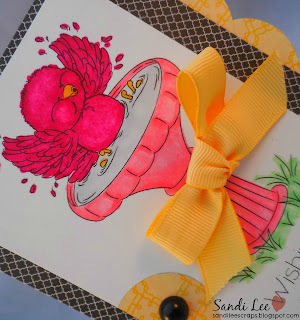 try stampin or not on tuesday/challenge #227..